If you are planning on starting your own business, chances are that you will need some type of license or permit - maybe more than one - to move forward legally. A business license is a permit issued by a government agency that allows business to be conducted in said government's geographic jurisdiction. By and large, your state or local government will determine which licenses and permits are required to operate in its jurisdiction. Additionally, the federal government requires special licenses for certain industries. Determining the requirements for your business is the first and most important step. The U.S. Small Business Administration provides a great resource for determining the licensing requirements in your area. After entering in your local zip code and the type of business you are starting, you are presented with a list of the permits and licenses you will need along with the locations at which you can find the requisite forms. Before you can apply for a license, you will need to determine your business activity code, which is based on the North American Industry Classification System (NAICS). In order to select the proper code, you must determine the activities from which your business will derive the largest percentage of its total receipts, which is defined as the sum of gross receipts or sales plus all other income. Do (or will) you have employees? Do (or will) you operate your business as a corporation or a partnership? Do (or will) you file any of these tax returns: Employment, Excise, or Alcohol, Tobacco and Firearms? Do (or will) you withhold taxes on income, other than wages, paid to a non-resident alien? Do (or will) you have a Keogh plan? Are (or will you be) you involved with any of the following types of organizations? Permits can usually be found online, on the website of the entity that regulates the specific regulated activity the business will engage in. For example, if your business is involved in agricultural activities, you can find the necessary applications at the website for the U.S. Department of Agriculture. If you plan to broadcast your own television or radio program, you can find the necessary application online via the Federal Communications Commission. It will also be necessary for you to register for applicable tax permits with state and local agencies. For instance, if your business will be selling goods or services, and you are operating in a state which levies an income tax, you will be obligated to obtain a tax license so that the state can track your taxable revenue. Contact the license commissioner in your county or municipality and the office of your state's Secretary of State to find out the exact requirements that apply to you. Expect to pay a filing fee, which can range from around $50 to hundreds of dollars or more, dependent upon the region you are filing in and the types of activities your business will be conducting. Fees are often calculated as a percentage of revenue, with a base minimum for new companies. The time it takes to receive your license can vary from a few days to a few weeks. 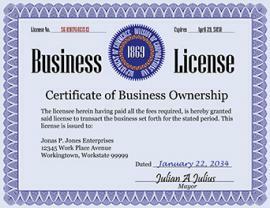 Obtaining the necessary licenses and permits for your business is required in order to operate legally. Moreover, the task is not a one-time occurrence. Most licenses and permits will need to be renewed periodically. For example, if you are running a restaurant with a bar, you will need to renew your liquor license once a year. While this process can seem daunting, being familiar with the steps will go a long way in making the experience as painless as possible.